Hot and delicious, this is a must! Lovely to serve with corn chips – you will get lots of thanks for this one! It just looks so good too. The recipe calls for beautiful ingredients like jalapeños, tomatoes, peppers (Anaheim and Bell). Chop up all of the ingredients either by hand or in a food processor. Combine all ingredients except for the cilantro in a large saucepan and bring to a boil. Reduce heat to low and simmer for an hour until thickened. Add the cilantro and cook for another 5 minutes. Meanwhile, fill a canner about ⅔ full with hot water and bring to a boil. Wash and rinse the canning jars and bands. This is an extra step, but also boiled the jars and bands for 5 minutes. Boil the lids for 5 minutes and then turn off the heat, leaving the lids in the water until ready to use. 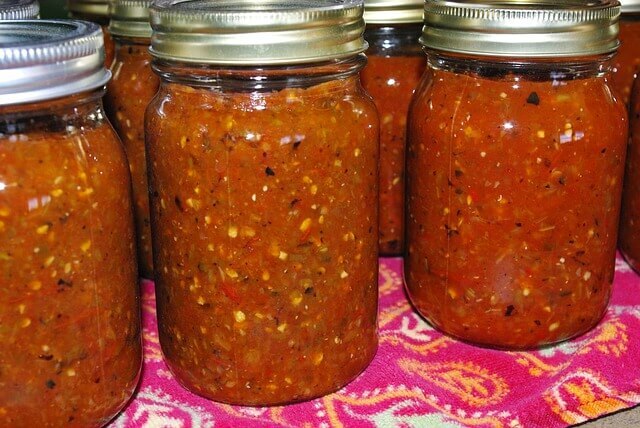 Fill each jar with salsa, leaving ¼ inch of space. Cover with the lids and screw the bands on tightly. Recommend using a funnel to fill the jars. Place the jars in the canner rack set on the edge of the canner and then lower into the canner. Pour in enough water to cover the jars. Bring to a boil and boil for 20 minutes. Carefully transfer the jars to a towel-lined surface and let cool completely. Refrigerate after opening. Hi Rosemary, thats great to hear! Its lovely to get feedback – enjoy!